Sat on the couch, clicking through the endless music channels to find the One Direction song that my daughter loves, I stumble across a video that had me hooked. No it wasn't 1D or the latest PSY hit, it was a video that had a story, no words spoken just the visuals and the song. It got me thinking that it would be a great focus to use for some writing. I am always looking for interesting and unusual hooks to get the children inspired to write, when I started thinking to some of my favourite music videos I found that many tell a story that has a lot of potential for writing activities in the classroom. Dropbox has become possibly the most valuable app since using iPads in the classroom. Linking them all up to one account and enabling automatic uploads has meant it has been a life saver as far as saving children's work to one location on my laptop without using any wire. As a teaching tool it is great to take a picture of a child's work, upload it to Dropbox and have it appear on my laptop within seconds so I can display it on the IWB. As a teacher is a great way to store files and means wherever I am on whatever device I can access my files. But there is another nifty trick Dropbox offers which provides great potential to using videos in the class to help children with speaking and listening and aiding the writing process. The trick is that Dropbox allows you to download videos straight to your camera roll, meaning they can then be imported into iMovie for endless amount of different tasks. I firstly joined Twitter in an educational context when I created a class account around a year ago after reading an article about how it can be used to share work with parents and friends of the school. 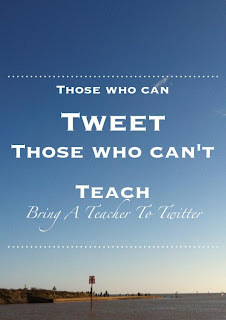 I had my own personal account where I followed friends, sports stars etc but had nothing to do with teaching - I had no idea the power of twitter as a teacher. Utilising the Emoji Keyboard in the classroom! Why should it only be children's work celebrated in Assembly? I really enjoyed some of the ideas shared to help reduce stress and I also shared some of mine. To read some of the fun ideas to reduce stress as a teacher - click this link to see some of the ideas shared during the chat, and click here for relevant links. I am a big fan of using multimedia as a way of stimulating children in discussions and writing. As the saying goes, 'a picture is worth a thousand words,' and using pictures and videos can really help children develop ideas and give them a purpose and focus for their writing. One website which is great for providing videos, pictures and other media that can be used in Literacy is the Literacy Shed. Started by @Redgierob, this amazing resource provides so many amazing resources to cover every aspect of the Literacy curriculum. Click here to read more about using videos and pictures in Literacy.